Linda Kozlowski played Sue Charlton in all three of the "Crocodile Dundee" films, but the only movie in which she truly qualifies as a heroine would be "Crocodile Dundee II". She's the wealthy daughter of a newspaperman and a reporter herself. One might tend to think that she is a bit pampered and spoiled, but don't be fooled. She likes the finer things in life and city-living, but she's not opposed to getting down-and-dirty against the bad guys. 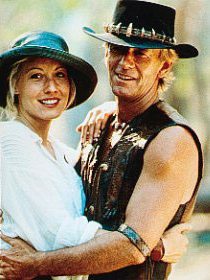 When she and Mick "Crocodile" Dundee go to the Australian outback to lure the evil Columbian druglords to their battleground, Sue gets her gun and is ready to fight. More importantly, she's willing to work with Mick because he is the more-experienced hunter and fighter type. She may not be a seasoned professional in this deadly game, but she's no slouch. Sue will stick with Mick to the bitter end. FYI: Mick and Sue kill all the main bad guys by the end of this movie.